Introduction: The ethical principle of autonomy as expressed in the practice of informed consent is a core tenet of clinical practice and good patient physician relationship. Aim: The aim was to identify specific gaps in the knowledge of trainee obstetricians and gynecologists in Nigeria about the informed consent process and its content. It also sought to describe the practice of informed consent in their respective institutions. Materials and Methods: A survey of Residents in obstetrics and gynecology attending the revision course of the Faculty of obstetrics and gynecology of the national postgraduate medical college was done to determine their knowledge of the informed consent process and its practice in their institutions. Results: None of the residents was able to give responses that contained all five conditions for informed consent to be valid. Furthermore, only 3 (2.22%) Residents mentioned that the name of the surgeon to perform the surgery should be part of the information provided to patients during the informed consent process. Similarly, only 8 (5.93%) mentioned that consequences of not having the surgery should be part of the informed consent process. The concept of the 'emancipated minor' being competent to give consent was known by 38% of the residents. Conclusion: Although Residents in obstetrics and gynecology in Nigeria have some knowledge of the informed consent process, this knowledge is deficient in key areas such as competence to give consent, content and scope of information to be disclosed to patients for surgery. There is a need to teach residents the rudiments of informed consent and bioethics in general. "I am completely satisfied that under normal circumstances no medical doctor can forcibly proceed to apply treatment to a patient of full sane faculty without the patient's consent, particularly if the treatment is of a radical nature, such as in amputations or other radical surgery. Hence, the doctor must ensure that there is a valid consent and that he does nothing that will amount to a trespass to the patient". Documentation of the informed consent process and decision of the patient. In recent times, some attention has been focused on informed consent procedures in developing countries including Nigeria. ,,,,,, Available literature in Nigeria indicates some deficiencies in the informed consent process in most hospitals. Jebbin and Adotey in 2004 surveyed 150 patients admitted for surgical procedures at the University of Port Harcourt Teaching Hospital. Only about 37% of the patients were informed of the possible complications of the surgery, and only 26% knew of the complications of anesthesia associated with the procedure. Similarly, in a study at the University of Benin Teaching Hospital, <25% of patients were informed of the risks of their planned procedure, and no consent document was signed in 11.3% of them. In another study, about 55% of doctors in the surgical specialties agreed that sufficient information is not provided to patients when obtaining consent for surgery. These reports suggest that there may be gaps in the knowledge of doctors concerning the informed consent process and therefore corresponding gaps in the practice of the informed consent process. Inclusion of bioethics in the curriculum of undergraduate medical students and postgraduate medical doctors would go a long way in correcting this deficiency. The positive impact of education on quality of clinical practice cannot be overemphasized. , Chima, in his study on the evaluation of the quality of informed consent and contemporary clinical practices by medical doctors in South Africa, concluded that continuing medical education for doctors and other health care professionals in ethics and medical law will go a long way toward improving the overall quality of healthcare service delivery in South African hospitals. This was the similar conclusion of Leclercq when he surveyed the practice of informed consent process in general surgery in the Netherlands. In advocating this and in order to develop the content of a training curriculum, it is imperative to assess specific gaps in the knowledge and practice of informed consent process by doctors. This survey aimed at identifying specific gaps in the knowledge of trainee obstetricians and gynecologists (OBGYN) about the informed consent process and its content. It also sought to identify the current practice of informed consent in their respective institutions. Findings from this survey may provide further justification for advocating for the introduction of informed consent process and practice within bioethics in the training curriculum and also provide information that may be helpful in designing the content of a training module. This was a descriptive study using a self-administered pretested questionnaire. All trainee OBGYN residents attending the 2013 revision course for the parts I and II postgraduate examinations of the Faculty of Obstetrics and Gynecology of the National Postgraduate Medical College of Nigeria in Calabar, Cross River, state were invited to participate in the study. In obtaining informed consent from a patient for surgery, list the information that must be provided to the patient to assist the patient in making informed decision about the surgery. The final part of the segment on knowledge, tested respondents knowledge of the legal person required to give consent in five different clinical scenarios. Each correct answer was given a knowledge score of one point. A maximum knowledge score of 18 points was obtainable for all complete and correct answers. The required sample size was calculated assuming a 95% confidence interval of 10% and an α (level of significance) of 0.05. Where n = minimum sample size; ²² = prevalence (assumed as 50%); CI 2 = level of significance (0.05). Required minimum sample size was 96 respondents. However, the questionnaires were distributed to all participants that attended the revision course. The coded questionnaires were inputted into the computer using the Epi Info (version 3.5.1.) statistical software (developed by center for disease control and prevention, Atlanta, Georgia). A descriptive analysis was performed using measures of central tendency, percentages and proportions. Knowledge score below the median (50 th percentile) score was rated as poor while knowledge score including median and above was rated as good. Thereafter test for associations for the knowledge score was conducted using Chi-square and Fischer exact tests as appropriate. The level of statistical significance was accepted at a P < 0.05. Ethical approval for the study was obtained from the Delta State University Teaching Hospital Health Research Ethics Committee and permission to administer the questionnaire obtained from the organizers of the revision course. Information about the survey was provided to all trainees, thereafter consenting participants proceeded to fill the questionnaire. One hundred and thirty-five questionnaires were filled out of the 182 distributed, giving a response rate of 74.2%. Eighty-eight (65.2%) participants were Residents in Federal Teaching Hospitals, 29 (21.5%) in Federal Medical Centers, 12 (8.9%) in State Teaching Hospitals, 5 (3.7%) in State Specialist Hospitals and 1 (0.7%) in the Mission Hospital. The mean number of years spent in residency was 2.78 years ± 0.96 and 122 (90.4%) of the participants were Registrars, while 13 (9.6%) were Senior Registrars. Eighty-five (62.96%) Residents obtained their basic medical degree 5-7 years ago, with the modal duration being 5 years. Over 77.6% of the Residents were in the age group 30-39 years. Fifty-five (41%) of the Residents have previously attended a lecture on bioethics, while 44 (32.8%) have previously attended a lecture on research ethics. None of the residents was able to give responses that contained all five necessary conditions for informed consent to be valid. Competence as a precondition for validity of informed consent was mentioned by 56 (41.5%) residents; Disclosure was mentioned by 102 (75.6%) residents; Comprehension by 64 (47.4%) residents, Voluntariness by 52 (38.5%) residents and Documentation by 62 (45.9%) residents. [Table 1] shows the residents' response on information that should be provided to prospective surgical patients during the consent process. Only 3 (2.22%) residents mentioned that the name of the surgeon to perform the surgery should be part of the information provided to patients during the informed consent process. Similarly only 8 (5.93%) mentioned that consequences of not having the surgery should be part of the informed consent process. One hundred and twenty-four (91.85%) correctly identified that the legal person to give consent in the case of the 22-year-old married woman for cesarean section (CS) is the patient herself. 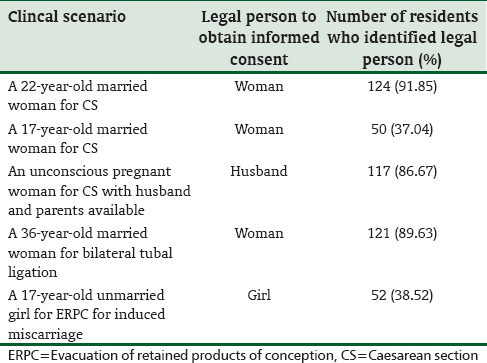 Only about 37% and 38.5% of the residents respectively identified that a 17-year-old married woman could legally give consent for surgery or a 17-year-old unmarried girl could legally give consent for an evacuation of retained products following an induced miscarriage [Table 2]. 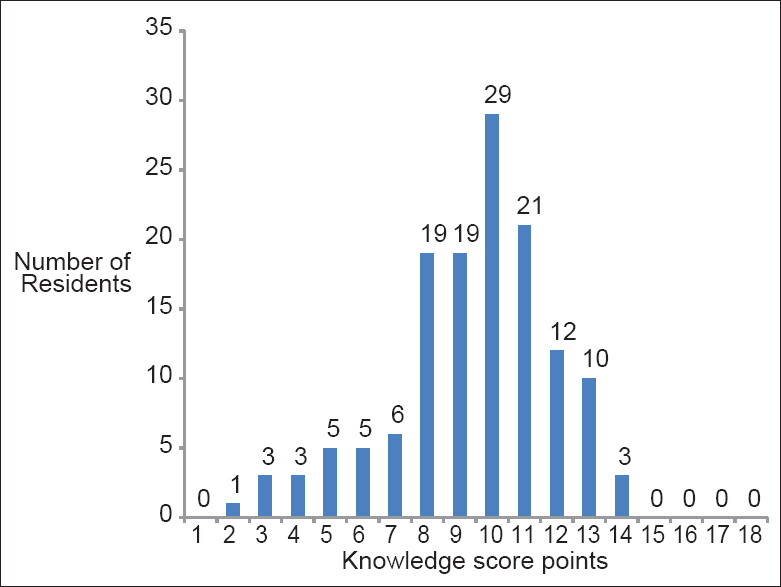 [Figure 1] shows the knowledge scores obtained by residents. Overall, the highest knowledge score by a resident was 14 points out of a maximum 18 points (78%). The mean knowledge score was 9.41 ± 2.48 points (52.3%); the median score was 10 points (55.6%). Sixty-one residents (48.1%) scored below 10 points (poor knowledge) while 74 (57.8%) residents scored 10 points and above (good knowledge). More residents that claimed to have attended a lecture on bioethics had good knowledge compared with residents that had not attended a lecture on bioethics, 56.36% versus 53.16%. However, this did not reach a statistically significant level (P = 0.85). Similarly, more senior registrars had good knowledge compared with registrars, but the difference was not statistically significant (P = 0.82). 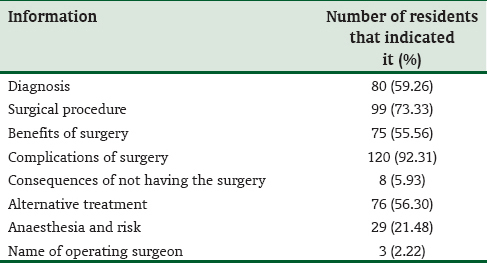 In the majority of health institutions (53.4%) where the residents practice the informed consent form was usually signed within 24 h of surgery, but not on the day of surgery. However, in 39.8% of health institutions, the consent form was usually signed more than 24 h before surgery, and in 6.8% of health institutions the consent form was signed on the morning of surgery. The venue where the consent forms were signed for elective surgeries was mostly the ward in 80.5% of health institutions and the clinic in 19.5% of health institutions. For emergency cases, consent forms were mostly signed in the ward in 69.7% of health institutions; Accident and Emergency room in 22.7%; Theatre in 5.3% and Clinic in 2.3% of health institutions. [Table 3] indicates the health worker who usually obtains the consent for various procedures. It showed an involvement of higher cadre of health worker with increasing complexity of the planned surgery in their respective institutions. 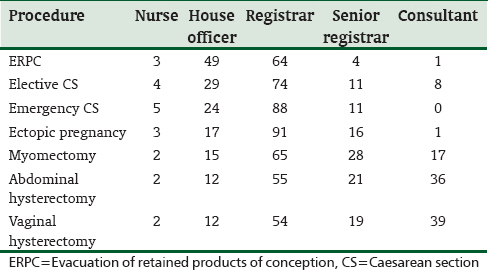 In obtaining consent for elective CS, the consultant is involved in 8 residents' health institutions, whereas, for vaginal hysterectomy, the consultant is involved in 39 residents' health institutions. This survey showed that none of the residents was able to mention all preconditions necessary for an informed consent process to be valid. Providing information - disclosure - was the condition mentioned by majority of the residents while voluntariness was the condition least mentioned. The fact that the condition of voluntariness was least mentioned is a reflection of the practice of informed consent process in most health institution which may possibly be due to the paternalistic attitude of the doctor. ,, Most doctors convinced of the benefits of the intended surgery to their patient often forget that the patient has the right to either accept or reject the surgery. Perhaps a major reason why residents were not able to mention all the five conditions for informed consent process to be valid, could be because they have not been well educated on the informed consent process. In our study, only 41% of the residents have previously attended a lecture on bioethics, however we did not seek information on the contents of the lecture. In a study by Agu in Enugu, 50% of consultants and senior residents have not received any formal teaching on informed consent. A formal lecture on informed consent would definitely include the conditions necessary for it to be valid. Most residents were involved in the informed consent process without being able to identify the various conditions or parts of the process. This is typical of knowledge gathered informally on the job, in contrast to knowledge gathered through formal lectures and structured training. In this survey, no resident listed the complete set of information that must be provided in the informed consent process. In particular, only 21.48% mentioned anesthesia and its complications as one of the information that should be provided to the patient and only 5.93% mentioned that they would provide information on the consequences of not having the procedure. About half of the residents indicated that they would mention alternative treatment options. These findings reflect the inadequacy of the disclosure in the informed consent process as practiced in most of our health institutions. Previous studies on informed consent process in Nigeria have highlighted the paucity of information provided to patients during the consent process. About half (54.9%) of the 102 consultants and surgical residents interviewed in South western Nigeria agreed that sufficient information is not provided to patients during the consent process. Similarly, in a review of the consent process at the Obafemi Awolowo University Teaching Hospital, Ile-Ife, in 2008, Adisa et al. interviewed 80 patients who just had surgery in the various surgical specialties. Only 15% had been informed of the type of anesthesia and possible complications from it, and only 26.25% were informed of alternatives to the intended surgical procedure. The least likely information to be disclosed in the informed consent process was the name of the surgeon for the procedure. Only 2.2% of the residents indicated that this particular information would be disclosed to the patient. This parallels the findings of Ogundiran and Adebamowo, in which the name of the surgeon likely to perform the surgery was disclosed only by 4.9% of surgeons. It seems that doctors and indeed health workers in Nigeria have not yet accepted the fact that it is the right of the patient to know the name of the health care giver. Residents' knowledge of appropriate legal person to give consent was evaluated with the use of 5 different clinical scenarios. Incorrect response was obtained mostly in the clinical scenario involving patients <18 years. This scenario was designed to test their knowledge of the concept of the "emancipated minor" - recognized by law as competent to give consent. In the 2 scenarios depicted <40% of the residents recognized the 17-year-old as the legal person to give consent. In Nigeria, as in most countries, the recognized age of majority is 18 years. This is the legal age of consent, however, the doctrine of "emancipated minors" recognizes minors under the age of 18 as competent to give consent for treatment. The definition of emancipated minors includes those who are self-supporting and not living at home, married or pregnant, a parent, those in the military or any minor so declared by the courts. It is important that residents are familiar with this doctrine in order not to deny minors access to needed medical attention by insisting on the consent from their parents or husbands. Surprisingly, although residents who claimed to have attended a lecture on bioethics scored higher than those who had not attended any lecture on bioethics, the difference was not statistically significant. It is difficult to precisely explain this finding, however several possibilities may exist. Perhaps the lecture on bioethics was an overview and did not adequately address the topic of informed consent. On the other hand perhaps our sample size was not large enough to detect any statistical difference, considering that the sample size was calculated primarily for descriptive purpose and not for comparative analysis. Finally, it is possible that our knowledge scoring system which gave a uniform score of one point to every correct answer was not sufficiently discriminatory. There is no doubt that improved knowledge of a subject can be impacted through lectures, other teaching methods and also through clinical practice. Informed consent is a process that culminates in the signing of the consent form. ,, The duration of the whole process vary according to several factors such as, the nature of pathology, nature and complexity of surgical procedure, timing of the surgery and level of understanding of the patient. The process may involve more than one health care provider for a particular patient. Information about the diagnosis, treatment and other relevant information may have been provided during consultative visits by a higher cadre doctor and the signing of the consent form supervised and witnessed by a junior cadre doctor. It is the duty of the witnessing doctor to ensure that all necessary information and conditions of the consent process have been fulfilled before presenting the consent form to the patient for signature. To this end, it becomes imperative that the witnessing doctor or health care provider be equally knowledgeable in order to provide to the patient this information if it had not been provided before or gaps were identified in the comprehension of the information by the patient. Major and complex surgeries would demand the participation of the operating surgeon in the informed consent process. , In this study, we expectedly observed a greater involvement of a consultant in the consenting process in planned major surgery. However, we also observed in this study that more consultants need to be involved in the consenting process, for example, while, in about 124 residents' institutions, the consultant would be the one to perform a vaginal hysterectomy; however in only 39 residents' institutions were the consultant involved in obtaining consent from patients. With the pivotal significance which consent for surgery holds in the overall patient care, and the gradually increasing level of litigation in Nigeria, it is imperative that more consultants be involved in obtaining consents from their patients for surgery. This will ensure that the patient is provided with all relevant and accurate information and that the patient has fully comprehended the information before deciding on accepting or rejecting the surgery. Limitations of this study include the fact that the sample was not a probability sample, but rather a convenience sample of all residents that attended a particular revision course. None-the-less, since the residents came from training institutions probably spread all over Nigeria, the findings could to a large extent be representative of the whole country. Furthermore, our scoring of the knowledge may be better refined to show finer discrimination in the level of knowledge of the informed consent process. This may involve unequal weighting of answers - giving more points to certain correct answers that reflect deeper knowledge of the informed consent process. 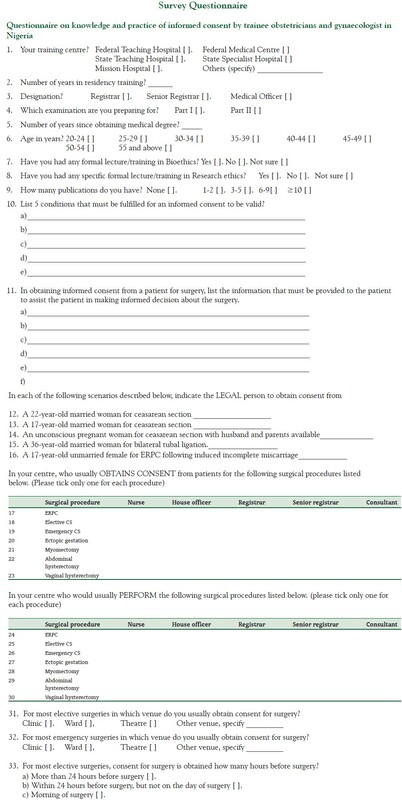 Residents in obstetrics and gynecology in Nigeria have some knowledge of the informed consent process. However, this knowledge is deficient in many key areas such as competence to give consent, content and scope of information to be disclosed to patients for surgery. Detailed teaching on informed consent should be part of bioethics that must be taught formally to residents. Institutional practices on informed consent and the consent form should reflect current best practices so that residents could also learn as they practice correctly. Due to limitations of this study further research need to be carried out to determine other factors and challenges that hinder adequate informed consent process in Nigeria. The author is grateful to the residents who participated in the survey and the Faculty of Obstetrics and Gynecology of the National Postgraduate Medical College of Nigeria for giving permission for the study to be carried out during their revision course. I gratefully acknowledge the assistance of Prof P.N. Ebeigbe in facilitating the conduct of the survey. Childers R, Lipsett PA, Pawlik TM. Informed consent and the surgeon. J Am Coll Surg 2009;208:627-34. Smith CK. Legal review: Informed consent - a shift from paternalism to self-determination? Top Health Rec Manage 1990;11:71-5. Schloendorff V. Society of New York Hospital. 211 NY 125, 126,105 NE92; 1914. Supreme Court of Nigeria. Nigerian Medical and Dental Disciplinary Tribunal V Okonkwo. 4 SCN 78: Nigerian Weekly Law Report; 2001. p. 205-55. Faden RR, Beauchamp TL. A History and Theory of Informed Consent. New York: Oxford University Press; 1986. Angelos P. More than a Document. The Importance of the Informed Consent Process. American College of Surgeons (ACS) Surgery News. 2013. Available from: http://www.acssurgerynews.com. [Last accessed on 2014 Mar 22]. Andanda P. Module two: Informed consent. Dev World Bioeth 2005;5:14-29. Adisa AO, Onakpoya UU, Oladele AO, Lawal OO. Informed consent in surgery: An audit of practice in Ile-Ife, Nigeria. Niger J Clin Pract 2008;11:206-10. Aliyu GG. Informed consent of very sick subjects in Nigeria. Account Res 2011;18:289-96. Bako B, Umar N, Garba N, Khan N. Informed consent practices and its implication for emergency obstetrics care in azare, north-eastern Nigeria. Ann Med Health Sci Res 2011;1:149-57. Dairo MD, Oyetunde MO, Olaitan PB. Informed consent in a tertiary hospital in Nigeria: How involved is the nurse? Niger Postgrad Med J 2007;14:209-12. Ezeome ER, Marshall PA. Informed consent practices in Nigeria. Dev World Bioeth 2009;9:138-48. Ogundiran TO, Adebamowo CA. Surgeons' opinions and practice of informed consent in Nigeria. J Med Ethics 2010;36:741-5. Taiwo OO, Kass N. Post-consent assessment of dental subjects' understanding of informed consent in oral health research in Nigeria. BMC Med Ethics 2009;10:11. Jebbin NJ, Adotey JM. Informed consent: How informed are patients? Niger J Med 2004;13:148-51. Osime OC, Okojie O, Osadolor F, Mohammed S. Current practices and medico-legal aspects of pre-operative consent. East Afr Med J 2004;81:331-5. Wood I. The effects of continuing professional education on the clinical practice of nurses: A review of the literature. Int J Nurs Stud 1998;35:125-31. Chen YC, Chang SC, Pu C, Tang GJ. The impact of nationwide education program on clinical practice in sepsis care and mortality of severe sepsis: A population-based study in Taiwan. PLoS One 2013;8:e77414. Chima SC. Evaluating the quality of informed consent and contemporary clinical practices by medical doctors in South Africa: An empirical study. BMC Med Ethics 2013;14 Suppl 1:S3. Leclercq WK, Keulers BJ, Houterman S, Veerman M, Legemaate J, Scheltinga MR. A survey of the current practice of the informed consent process in general surgery in the Netherlands. Patient Saf Surg 2013;7:4. Murray B. Informed consent: What must a physician disclose to a patient? Virtual Mentor 2012;14:563-6. Irabor DO, Omonzejele P. Local attitudes, moral obligation, customary obedience and other cultural practices: Their influence on the process of gaining informed consent for surgery in a tertiary institution in a developing country. Dev World Bioeth 2009;9:34-42. Angelos P, DaRosa DA, Bentram D, Sherman H. Residents seeking informed consent: Are they adequately knowledgeable? Curr Surg 2002;59:115-8. Ka A. Informed consent policy and Surgeons in Southeast Nigeria. Niger J Surg 2003;9:39-41. Wallach T. Rights of children: Statutory emancipation in California: Privilege or poverty. J Contemp Leg Issues 1999;11:669-671. Anderson OA, Wearne IM. Informed consent for elective surgery - what is best practice? J R Soc Med 2007;100:97-100. Department of Health. Reference guide to consent for examination or treatment. Department of Health 2009. Available from: http://www.gov.uk/goverment/uploads/system/uploads/attachement-_data/file/138296/dh_103653_1_pdf. [Last accessed on 2014 Mar 22].